This exquisitely rendered natural history print is from a rare monograph on butterflies from famous collections of specimens of the period, which was produced by Dutch butterfly experts. The plate combines scientific accuracy and a sophisticated aesthetic sense in terms of the arrangements of butterflies, as well as in the depiction of colors and decorative patterns. 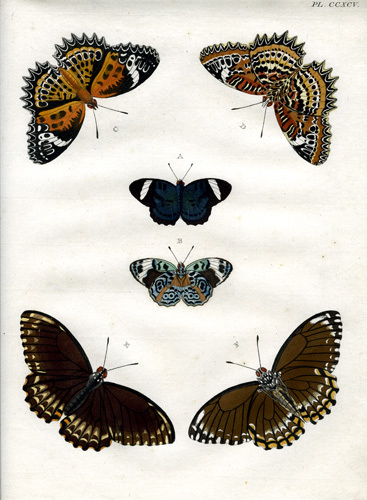 The entire work (Papillons Exotiques des Trois parties du Monde: l’Asie, l’Afrique et l’Amerique” [“Exotic Butterflies from Three Parts of the World: Asia, Africa and America”]) represents the first color book on exotic butterflies arranged in accordance with the Linnean system of classification. Pieter Cramer (1721-1776) was a merchant in Spanish wool with a great interest in butterflies. He began the project of editing this comprehensive illustrated publication, but when he died in the midst of it, the remaining volumes were edited by C. Stoll. The painter Gerrit Wartenaar Lambertz was commissioned to paint first the butterflies in Cramer’s collection and then in other “cabinets of curiosities. Throughout the book names of owners of Cabinets are mentioned, including Pieter Boddaert, Houttuin, P. Luchtmans, Prince Willem, Baron van Rengers and many others. Lambertz depicted over 1,650 species of butterflies in top and bottom views at life size. The beautiful copperplate engravings were finished with delicate realistic handcoloring.